The word “determined” best describes Capricorn, which is why Pluto in Capricorn can handle change. But for them, it’s more about taking control and building toward something that will be advantageous. Their incredible discipline helps to turn their ambition into something real and tangible, offering them more wealth and power. Pluto represents rebirth, transformations, spiritual growth, and the obsession with power in astrology. For Pluto in Capricorn, it’s all about having the power to do what you want, when you want. But they aren’t as selfish as other zodiac signs in the zodiac. For them, it’s more about their image and maintaining a certain kind of status. As an earth sign, they are more concerned with material possessions and showing off how important they are. Pluto in Capricorn will only go to great lengths to reinvent themselves if they feel the path they have chosen will not work out as they originally planned. They invest a lot of time and effort into coming up with a strategy for their life and their future. So they don’t randomly throw all that away on a whim. It takes a lot to get them to change course. But once they do, they will ponder the true meaning of their existence to figure out the next best course of action for themselves and their loved ones. And their persistence always pays off, for the Capricorn Pluto sign is a wonderful strategist. Even if they don’t go through their own spiritual growth a lot, they can often help others accomplish their goals. Their practical and logical nature helps to keep themselves and others on track to achieve the kind of success they never would have dreamed possible otherwise. They can cut through any chaotic situation to bring about peace and clarity, for their organizational skills are unmatched. The appearance of wealth, prosperity, power is integral to their ability to climb the corporate ladder. They aren’t as concerned about metaphysical subjects as they are knowing the truth about the way the world works. The only time the Capricorn men search for deeper meaning is if they believe there is more going on behind the scenes at their company or in their family dynamics. For some who don’t like to wait, Pluto in Capricorn can seem slow or boring. They are so stubborn they can’t be budged by anyone or anything. The Capricorn Pluto sign don’t do anything halfway – for them, it’s all or nothing. This is why they strive to be the authority in everything they do because they don’t trust others to put in as much effort as they do. 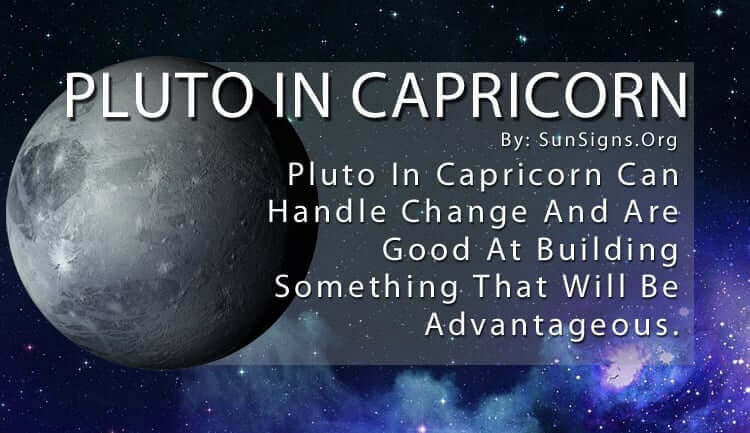 It’s all serious business with Pluto in Capricorn, with no room for error. They have as much drive as their symbol, the mountain goat, and will forge ahead no matter what the forecast. And if a sudden obstacle gets in their way, they will either move it or patiently go around it. Nothing can stop them from reaching their goal. They are prudent and patient, which allows them to move forward at a steady pace once they have a plan. However, those who know them best want them on their side during any difficulty in life. They are incredibly trustworthy and solid. Their ability to gain control of chaos and turn it into something productive is what keeps them successful.